Friday was Progress Report Day. That meant it was the end of the 5 week reporting period. I ran my deficiency lists and know which students are failing a class. In my aim to address student progress this year, I now have my list of students to target and work with. 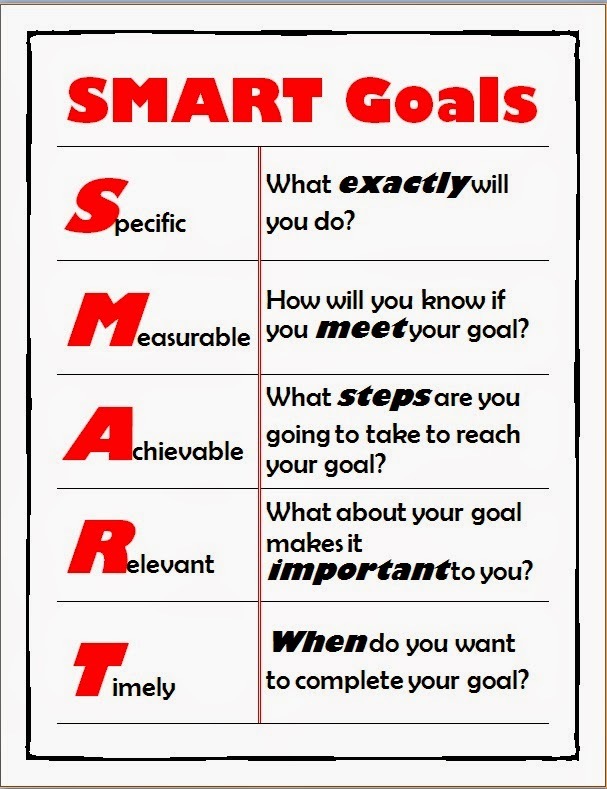 One of the first things I will do with these students is go over SMART goals. Here is a poster I will display in my room and our Plan Writing Worksheet. 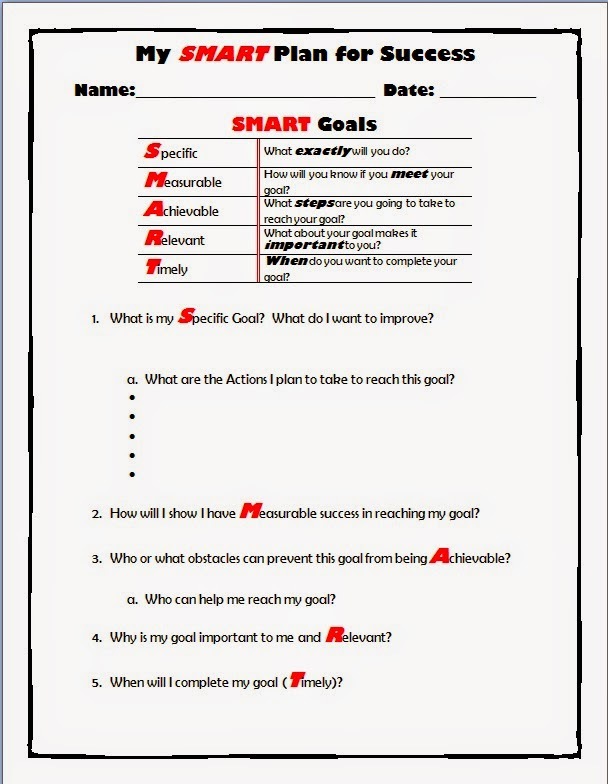 I'll also have each student complete a self-assessment of their study skills and behaviors. I will use this as a basis for what they view as their strengths and weaknesses. Over the next several weeks I'll check their grades and homework completion and meet with them weekly. It really makes a difference to meet with the students. Last year we started with 35 course failures for grade 8 and by the end of 40 weeks had brought that number down to 14 course failures. If you have a program, don't forget to collect your data. This is one easy way to check on the effectiveness of your program. Hi Carol! I have a similar plan. Printed off the f-list and targeted each student with 2 or more f's. Anyone with an f is someone I wish to work with, but I'll be honest...those with 2 or more are my priority. I printed off their schedules and highlighted the courses they are failing. Then I meet with each student and write down their plan for success. I gave each of them a time when I would meet with them again to see their progress. What do students use for self assessment re: study/organizational habits? How do you make time for weekly meetings for 35 students? I am a high school counselor and that is really difficult to do especially with college applications. Any strategies you can provide? Based on what I have learned thus far, this seems to be the most difficult part of the process. Meeting with individual students while trying to reach all of the students seems demanding. In learning about how to approach the whole child, as I referenced in another post, time management and targeted goals would seem paramount. In my estimate, 35 individual meetings would take at least a day and half, each being 20 minutes. I would also be looking for strategies with how to manage that! I am a graduate student studying mental health counseling and am taking an elective in school counseling because I will be working with middle and high school aged kids in community group homes upon graduation. The SMART goals in the school systems are new to me, but seem like effective means of eliciting progress from kids while simultaneously creating relevant data for analysis. School counseling is definitely more involved than I initially thought. Thanks for all of your work. lão muốn Ngài lập tức tới ngay đó! - Liên Na cố hết sức mới trả lời được . bên, thần sắc khẩn trương cực độ! - Lai Bố Ni Tư, có chuyện gì thế? Đây là cái gì ? tinh, cảm thấy hơi nghi ngờ, nguyên nhân vì đó tuyệt đối không phải là rượu! nguyên tố đậm đặc không? rất hưng phấn đưa cái chén thủy tinh cho Đoạn Vân. The success is for the students who works smartly rather than hardly. The students should practice the essential academic skill to succeed in the life. Thank you for this resource! !